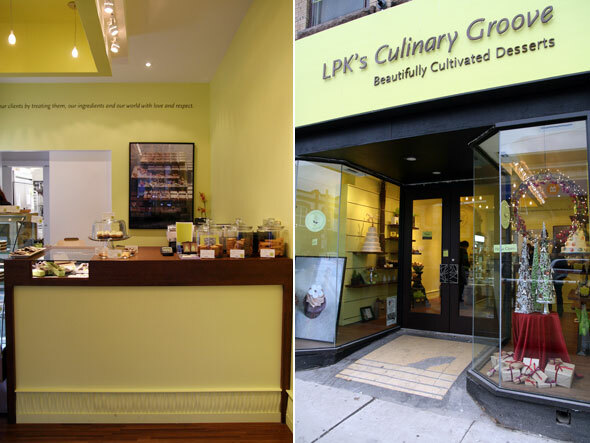 A recession may not be the best time to open a high end bakery, but if anyone can pull it off it's probably Lesia Kohut and her team at LPK's Culinary Groove . Coming off years of running a successful catering business out of her home kitchen, she has now gone retail, selling gourmet cakes, tarts, cookies, pastries and truffles from a green-accented spot near Dangerous Dan's Diner at Queen and Broadview. Green is a recurring motif at this bakery. Not only are the walls painted a vibrant citrusy colour, but the business is very much focused on reducing their impact on the environment. They use certified organic and fair trade products wherever possible and they package up their sweets in bio-degradable containers. They also source many of their ingredients locally, although they make exceptions to bring in quality products from further a field such as ultra-rich cream cheese from Quebec. Walking into the bakery, I spot items that only hint at the goodness that lies in store. Shelves are lined with pre-packaged chocolate, shortbread and cookies. But the indulgence doesn't come cheap. 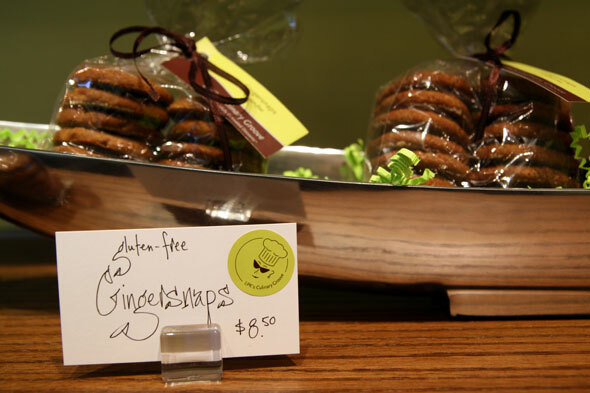 10 smallish gluten-free ginger snaps run $8.50. A dozen or so gluten-free graham crackers cost a whopping $16.25; and six pieces of "oversized shortbread" are priced at $15.25. 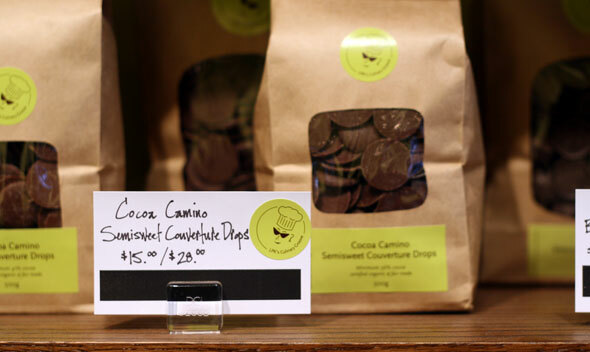 There's also Cocoa Camino Semisweet Couverture Drops ($15 for a small bag or $28 for a large) plus a range of freshly-baked tarts like chocolate pecan, chocolate peanut butter mousse and lime cream in a graham cracker crust that are a more modest $5.25. While most of the offerings here include the usual buttery and fatty goodness that's to be expected, the kitchen does make an effort to cater to those with dietary restrictions. There are a number of vegan and gluten free options available off the shelf; and any of their cakes can be custom ordered to meet customer specifications. One of the top sellers so far is the coconut lime cake which happens to be both vegan and gluten free. The 4 inch version is ready for pick up at $20 but larger sizes (6, 8, 10 and 12 inches) range from $30 to $65. And if these prices are a bit beyond what you can stomach, there's always a chance to make some of them yourselves. The store offers three different baking classes - including Baking, Pastry and Chocolate Basics. But lessons don't come cheap either and cost $400 for six people.